We broke out the tie-dye and grooved with our 60s Costumes at the My Friend’s Haus Adult Day Center on Sept. 27. for a fundraising dinner. The Mod 1960s Dinner and Dance Soirée included a dinner and dance, live bands, 1960s custom cars and live and silent auctions. The annual event is the only major fundraiser for My Friend’s Haus, a program of the Comal County Seniors’ Citizen Foundation. “This helps us to continue to serve our clients,” Gunderson said, adding that the adult day care facility currently serves about 50. The nonprofit organization opened in 2006 and serves aging adults and anyone older than 18 with a disability. The facility at 790 Landa St. provides nursing services, meals, activities in and out of the facility, and transportation services to dependent seniors and disabled adults. The center is open from 7 a.m. to 5 p.m. daily Mondays through Fridays. Motown sounds of Big Daddy Dean. 1960s tunes by Texas Tide, including Beatles and Beach Boys songs. Silent and live auction items will include Wurstfest and Schlitterbahn tickets as well as spa and restaurant gift certificates. Werner’s Catering will be offering food stations during the evening’s dinner. 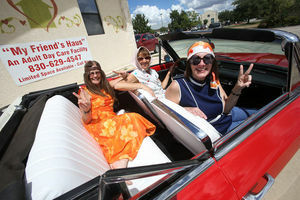 Linda Klecka, left, Marcia Kelly and Raelynn Gunderson sit Friday in Kelly’s 1962 Buick Skylark.